1. 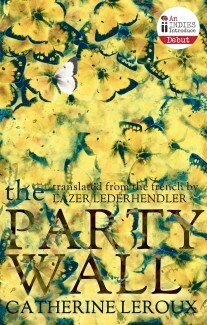 The Party Wall is a novel of pairs. Where can you see duality in this book? 2. Although Madeleine’s situation is unique, many of her struggles could be considered universal. Do you identify in any way with Madeleine? Why or why not? 3. How do you think the narrative would be different if Ariel and Marie’s story ended after the big revelation? What do you think is the effect of showing the consequences of that pivotal moment? 4. Simon and Carmen may experience an earthquake in a way that none of the others do, but in what sense do all the characters have to deal with their own personal earthquake? 5. What do you think is the effect of using “The Sisters in the Walls” as a way to close the novel? What does it mean for Monette and Angie? Do you think the sisters in the walls represent any of the other sets of characters in the novel? 6. Is the ending satisfying to you? If so, why? If not, how would you change it? Do you feel differently about the individual endings to each narrative thread? 7. If you could ask the author one question, what would it be?